The below analysis cloud can rate the company on 25 fundamental parameters , select the rating of each parameter on previous 2 sheets.It is suggested that investor should rate each of the 25 parameters to cover each aspect of company's business. Analysis cloud give weightage to each fundamental parameter.Weightage can vary from 3 to 5.Parameter with higher weightage will have bigger circle in the cloud.For e.g cash flow has weightage of 5 so it will have cirlce with maximum size. Now rating of each parameter can vary from 1 to 5.Poor rating i.e 1 is shown in red and best rating is shown in dark green color. infosys has GP margin of 45 , TCS has around 40. Automobiles companies like Maruti has GP margin of 16-17%. For Titan it is 20% , as cost of raw material (gold) is very high in this case. Companies with GP Margin of 40% or better tend to be companies with some sort of durable competitve advantage. GP margin below 20% is a indicator of very competitive industry, where no one company can create a sustainable competitive advantage over others. Operating profit or operating income is a measure of a firm's profit that excludes interest and income tax expenses.It represent the money which firm makes from operations. Operating Profit (OP) = Revenue – Operating expenses. Operating expenses = SGA + Depreciation + R&D Cost. In a given industry , Company With greater OP Margin is supposed to be better as the company is generating greater amount of income from Operations. For e.g in IT industry Infosys has OP margin of 32-37% , TCS 27-34% , HCL 20% , Mindtree 13%. In 2 wheeler industry , Hero MotroCorp has OP Margin 11-16 in lasy 3 years whereas Bajaj Auto shows 19-24 in last 3 years. 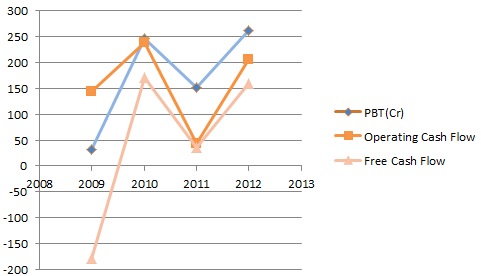 2 Operating margin is above 10% , in 2009 it went down due to forex loss. Operating Margin is much less compares to other IT majors like Infosys , TCS.Infosys operates at 35% , TCS at 28-29%.The main reason for this difference is that this company has different pricing policy.Billing rates are less compared to Biggies whereas the employee cost and other expenses remain in same ratio. Net Profit or Net Income is a measure of the profitability of a venture after accounting for all costs. Net Profit = Sales - Cost of Goods - SGA - Depreciation - Interest - Tax. For e.g is a Company is doing sales of 100Cr and Net profit is 22Cr then it NP Margin is 22%. Infosys NP Margin is 27% , Colgate 15%, Maruti Suzuki 5-7% , Eclerx Services 34% in Fy11. If a Company is Showing NP Margin greater than 15% consistently for last 5 years then it is very much likely that this company has some competitive advantage. If NP Margin is less than 10% then company is either in very competitive industry or it is in industry which requires lot of cost on raw material , property, plant and machinary or it may be spending lot of money on R&D. For e.g Titan has NP Margin of 6%.It is because that main source of Income for Titan is its jewellery business in which the cost of raw material , which is gold or diamond, is very high.So Despite being a Great Company , it has NP Margin of 6%. 3 Net profit has improved in last year.In Q1 Fy13 it was 15% and in Q2 Fy13 it was 12%. Company is recovering from bad times.Quarterly results are now more predictable. Under which company reports its cost for direct and indirect selling expenses and all general and administrative expenses.These includes management salaries , advertising travel costs . legal fees, commissions, all payroll cost. Infosys SGA% cost is 16%, Titan 37%, Colgate 42%.Maruti Suzuki 14-23%. Great companies do not show much variance in SGA cost , you can refer last 5 year data for these companies. 3 SGA expenses are under limit with less 30% of Gross Profit. In 2009 it went up due to forex loss. All machinery and builings eventually wear out over time.This wearing out is recognized on the income statement as depreciation. For e.g a manufacutring company buys building, plant and machinery for 100Cr, assume that life expectancy is 10 years for property , plant and machines. Now (100/10) 10 Cr will be deducted as deprecation amount from income statement.After 10 years company has to buy new building plant and machinery with additional cost.Deprecaition cost vary from industry and tends to be high for manufacturing industry and low for service industry. Depreciation % = Depreciation/Gross profit. Cipla has Dep% of 8 , Titan 2-4%, Infosys 5-8%, Maruti Suzuki 14-20%. Great companies generally have less depreciation and is less than 7-8%. 2 Depreciation cost is little on a higher side and computers, softwares and leases taking the major depreciation cost. Interest expense is due the the interest that company has to pay on the debt present on balance sheet.Company may need debt for working capital or may need additional money for increasing capacity.For this debt , company has to pay interest.This interest expense is deducted from Profit of the company. Interest expense can depend on industry type.Automobilies companies like Tata Motors , Maruti need large plants and machinery and hence debt needs to be taken. Good companies generally have Interest expense less than 15% of Operating Profit.This is not applicable for Banks and Financial institutions as their business in taking debt at low cost and giving loan at higher interest rate. 5 Company is essentially debt free.It has loans of 137Cr in 2009 which has now reduced to 40cr. Good companies show consistent Net Profit which increases year after year. Titan's Net Profit is increasing at a average rate of 34% for last 5 years.For Infosys it is 14% .For Jubiliant foodworks it increased at rate of 100% between 2007 and 2011. For considering Investment in any given company , please check last 5 years net profit of the company. Note that if company buy back its shares than its Net Profit may appear less compared to last years but it is very good condition which reflect that company is doing good and it has enough cash to buy back its shares. Earning per Share is equal to Net Profit divided by number of outstanding shares. We should look for atleast last 5 years of EPS figure to check if the company has competitive advantage. EPS is impacted by bonus shares , splits , issuance of more numbers of shares. Dividends are payments made by a corporation to its shareholder members. It is the portion of corporate profits paid out to stockholders.When a corporation earns a profit or surplus, that money can be put to two uses: it can either be re-invested in the business (called retained earnings), or it can be distributed to shareholders. There are two ways to distribute cash to shareholders: share repurchases or dividends. Many corporations retain a portion of their earnings and pay the remainder as a dividend. We shoud check the dividend history to see if company has been regularly paying dividends to its shareholders. Many companies prefer not to give dividends rather they spend the excess money on future expansions which should be fine till the time the company is able to generate good return on incremental capital invested in the business. But when we are investing in company for its dividends then we should also check dividend yield. If face value of Company's share is 10 Rs and stock market price is 800 Rs. the amount found on the balance sheet for inventory is the value of the company's inventory on that date. Cost of inventory mentioned on balance sheet may not be correct as the product might have become obsolete/outdated. For e.g if the Garment company shows inventory of 400Cr then we may not be rely on this number as some of the Garments may have become obsolete and have no significance value but on balance sheet it is shown of full value.On the other hand if we take company in Jewellery business than inventory should be of reasonable value as more than 90% cost of the product is either gold or diamond. Second important point about inventory that if inventory is increasing year by year then its sales and net profit should have the same or better growth rate than that of inventory. How stable is the business of the company? Does the company have any sort of competitive advantage? Quality of Managment team and is the background clean? 11 Business , Advantage and Quality of Management Business is to provide IT solutions to clients.Main tasks are application development , maintenance and support.Company has 2 segments :IT services and Product Engineering.IT services business has 65% share and PE has 35% share. IT services business is growing well and is main driver of growth.PE business is facing challenges and it more or less stagnant. 3 Mindtree has good management team.Subroto Bagchi Co-founder and chairman.He is a well known public figure. Krishnakumar -KK is the CEO,MD and co-founder with more than 30 years of experience in IT industry.KK is also the Vice Chairman of NASSCOM. Overall the management team looks good. Current ratio tells about the liquidity of the company and also tells if it can meet the short term debt obligations. The higher the ratio , the more liquid the company. A current ratio of over one is considered good and anything below one bad. If it is below one , it is believed that the company may have a hard time meeting its short term obligations to it creditors. Please note that lot of good companies often have their current ratio less than one. Bajaj Auto has current ratio is .88 , Hero Motorcorp .24 .Some may think that these companies might have difficulties paying current liablities.What is really happening that their earning power is so strong that they can easily cover their current liabilities. Debt to Equity ratio can tell us the relative proportion of shareholders' equity and debt that company is using to finance its assets. Debt used above is generally the long term debt and does not include current liablities and provisions. Great companies generally use their earnings to finance its operations and therefore should have less debt in comparison to equity. For non finance institutions D/E should be preferably less than .8. Banks and finance institutions borrow large sum of money and then loan it back out, making money on the spread between what they paid for the money and what they can loan it our for.D/E equity ratio is of less relevance for financial institutions. Infosys has D/E of 0 means no debt, Titan 0 , Maruti Suzuki 0.02 , Kingfisher Airlines(KFA) -2.39 , minus as it has negative shareholder equity. KFA is making losses from last 8 years and all these losses are subtracted from shareholders equity. Vadilal Industries 3.29. We should note one more point here that some comapnies can show less D/E due to buybacks. Besides knowing debt/equity ratio , it is also important to know how much debt company needs to pay and whether it has capability to repay its debt. Consider an example in which a manufacturing company has 5000Cr in Debt.This money was used for building new plant and machinary.Now if this company has shown average net earning of 250Cr earnings in last 2-3 years then it should ideally take around 5000/250 = 20 years to pay its debt.Here we have assumed that earnings are not going to rise exceptionally. Even if we consider than earnings will increase at a rate of 20% even then it will take 9 years to just pay of its debt assuming that entire earnings is used to just pay the debt. A company can have a lot of sales and Net Profit on income statements but still may be deprived of cash so it becomes important to check cash flow of the income along with income statements. A company may be showing lot of profit on income statements but it may be having problem in getting money from the sales of goods in this case net recievables will increase drastically so cash from operations can tell us the true picture. We should check how Cash flow from operations is doing against net profit. Cash from Operations should ideally be greater than net profit so check the track record of net profit vs operating cash flow for past years. 4 Company is generating good amount of free cash flow.Operating cash flow looks good in comparison to EBITA , refer to below graph. Free cash flow has been positive and in good amount for last 4 years except for 2009 in which Mindtree acquired Aztecsoft for 291 cr, pune based company.Mindtree holds around 80% stake in Aztecsoft. It measures management effecieny in allocating resouces to generate more and more profit. Great companies show higher than average ROE such as 20-25%. Titan has ROE of 41% , TCS 38-44%, Maruti 16%, Cipla 14%, Gitanjali Gems 9%. Some companies use lot of debt to support its operations and this can result in high return on equity. But we should avoid companies which are using lot of debt to increase its earnings. For e.g Suppose a company A has equity of 100 Cr and Net earnings of 20Cr so ROE is 20%. Company B has 100 Cr equity and 200 Cr of Debt and net earning of 25 Cr , now ROE is 25%. Company B shows vurtually high ROE as it is using lot of much higher debt compared to equity. Long term graph of a stock can tell a lot about company. Great companies do not generally show lot of spikes in the long term chart and their chart follows the earnings of the companies. If there are unusual spikes we should check if the whole market is following same or it is just the concerned company. If there are unusual spikes during a particular then we should check the news and earnings of that company in that period. It may happened that company was suffering from a temporary problem due to which stock price was hammered but it got rebounded when the problem got resolved. What we should check if that problem should be a temporary one , if a company was facing a long term problem like losing its ground due to large number of competitors , or slowdown in the industry then stock price may have not rebounded. Companies in cyclical industry shows lot of up and down in the stock price. Prices fell sharply when economy is declining and they rebound when economy is on the rise. Sun Pharma has a shown a very good chart for last 10 years , same for ITC and Colgate. These companies has shown that they were not very much impacted by various sow downs that we have seen in last 10 years. 17 graph of stock price Graph of stock has not been great as there are lot of variations in the earnings. Company's Net Profit can either be paid out as dividends or can be used to keep the business growing. It can also be used for buy back the shares.When it is retained in the business, it is added to balance sheet under shareholder's equity, called Retained Earnings or Reserves. If company is making profit after paying dividends then reserves will keep on increasing year after year. If the company makes loss in a year and this loss is subtracted from reserves causing depletion of reserves. Analyzing the growth of retained earing is a important factor while analyzing the company. Titan's Reserves have been increasing at average rate of 36% for last 5 years , for Colgate it is 30% , Maruti - 20%. Reserves can also be increased when one company acquires another company , in this case retained earnings of both the companies are added to the balance sheet. Company can use it retained earnings/ reserves for capacity expansion Or it can use access cash to invest. It can invest it long term bonds, stocks , real estate ,fixed deposits or can acquire other companies. Long term investment can also reflect investment in the company's affiliates and subsidiaries. A company long term investments can tell us a lot about the investment mind-set of top management. Do they invest in business that have durable competitive advantage or do they invest in business that are in highly competitive markets? Beware of companies that use excess cash to make ambitious acquisitions as it can erode the entire reserves of the company. We should also look at the revenue , profitablity , return on equity and competitive advantage of the acquired company. You can get details of long term investment in the balance sheet of the company. 2012--917.10 4 Retained earning has been growing at a good rate.Retained earnings are being mainly used for acquisitions , investment in mutual funds and expansion of gross block. In 2009 , Aztecsoft was acquired for 291 Cr.In Oct 2009 , it acquired Kyocera Wireless for 43 Cr.Some part of the money was used for leasing , buildings , software etc. In last 2 years extra cash was used to invest in mutual funds .Company has around 438Cr in cash and cash equivalents as of Q2 Fy13. This ratio shows the relationship between the stock price and the earnings of the company. It is simply calculated as stock price divided by earning per share. 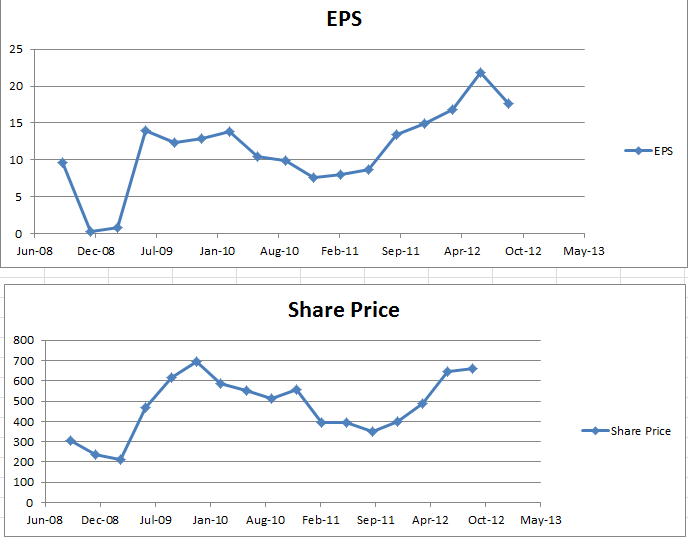 Trailing p/E - in this stock price is divided by last 12 months eps. Forward P/E - in this stock price is divided by forecasted eps for the next 12 months. P/E ratio can be thought of as the number of years it will take the company to earn back the amount of your initial investment assuming that the company's earning remains constant. P/E ratio is often useful to measure any stock is overpriced , fairly priced , or underpriced relative to company's money making potential. p/E varies from industry to industry for e.g FMCG are currently priced in 35-40 PE , Software companies used to have PE of 25 before 2010 but now are running at PE 15-20 as the whole IT industry has slowed down a bit.Automobiles generally have PE 10-14 etc. The P/E ratio of any company that's fairly priced should equal to its growth rate.If TCS is having a P/E ratio of 20 , we would expect it to grow at 20% per year. N/A - A company with no earnings has an undefined P/E ratio. By convention, companies with losses (negative earnings) are usually treated as having an undefined P/E ratio, even though a negative P/E ratio can be mathematically determined. 0–10	Either the stock is undervalued or the company's earnings are thought to be in decline. Alternatively, current earnings may be substantially above historic trends or the company may have profited from selling assets. 10–17	For many companies a P/E ratio in this range may be considered fair value. 17–25	Either the stock is overvalued or the company's earnings have increased since the last earnings figure was published. The stock may also be a growth stock with earnings expected to increase substantially in future. 25+	A company whose shares have a very high P/E may have high expected future growth in earnings, or this year's earnings may be considered to be exceptionally low, or the stock may be the subject of a speculative bubble. Avoid companies with unrealistic P/E ratio , some companies may be operating at a P/E of 40-60 or even more.Market is assuming that these companies are going to grow at 40-60% per annum.In most cases , companies fail to deliver that much growth 19 P/E ratio Mindtree has a p/E ratio of 10 as of nov 2012 , which is at discount compared to peers. Geometric - 9 3 So PE of mindtree stands at 9-10 which seems to be justified as the company is mid sized and period from 2008-2010 has not been very encouraging. Intangible assets are assets we can't physically touch; these include patents , copyrights, trademark, brand etc. Brand value is one of the most important parameter for the success of the company. The important point about brand value is that it is not considered as a asset on balance sheet. Titan , Asian Paints , TCS also these companies have tremendous brand value due to which they can sell their product and services at a premium compared to their competitors and hence can enjoy better margins.So this piece is hidden which is not present in financial statement and can only be found out by doing research on the company and its industry. One can mention brand value as a asset on balance sheet if this brand value is acquired through acquisition. 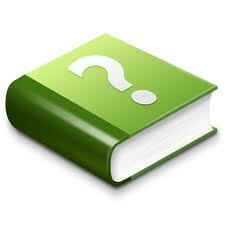 For example , if a company A buys a Company B , which has book value of 100Cr. Company A pays 300Cr to acquire Company B.Now this extra 200cr has been paid for the brand value and it will mentioned as goodwill asset of 200Cr on the balance sheet of company A.
Internaly developed brand value is not mentioned as assets on balance sheet. We should look for companies which have good brand value.Asian Paints , Titan etc have brand value of thousands of crores due to which they enjoy leadership in their respective industries. Check if company has good brand value and other intangible assets 20 intangile assests , brand value and does a company have advantage over others Mindtree has a strong brand value in mid sized IT space. when insiders are buying then it is positive sign which indicates that company's management believe in the business of the company.When management owns stock , then rewarding the shareholders becomes the first priority , whereas when management simply collects a paycheck, then increasing salary becomes the first priority. When you see that even the employees of the company are buying the shares of the company then it could be highly positive.Employees have edge than normal investors in terms of better knowledge about operations of the company and it is generally a positive sign when they buy. Buying back Buying back shares is the simplest way a company can reward its investors.Due to buy back , outstanding number of shares get reduced which have positive impact on EPS. Buying back of shares also stabilizes the share price if it is on the fall for a while. 21 are insiders buying the stocks , is company buying back shares , are mfs holding this company Company's Stock is held by more than 20 mutual funds and some of them have upped their stake in Q2 Fy13. 4 Siddartha , founder of CCD has increased his stake from 17.79 to 21.26 in June 2012.He bought at a average price of 610 Rs in june 2012. Foreign institutional investors are heavily invested in the company and now FII investment limit has reached. We can divide company into various types like low Growth, Stalwarts, Fast Growers , Turn arounds , Cyclicals based on its growth rate. Stalwarts - Big companies which are growing at a rate of 12-20%.These are generaly powerful companies with stable business model.E.g Infosys , TCS, Cipla , Sun Pharma , Tata Motors , ICICI Bank etc. Turn Arounds - Companies which which were doing good earlier but now struggling or Company which were in bad condition earlier but are now recovering can be put in this category.E.g Satyam is a example of company which was struggling in 2009 but it has start showing recovery from 2012. Knowing the growth type of the company helps us to calculate the potential upside in the investment. For e,g stalwarts may give 20% returns annuals and investment is less risky , on the other hand Fast grower can become a multibagger in span of 3-4 years but he risk is higher. Impact of Industry parameters and Government policies Mindtree is a mid sized company with revenue of 1900 Cr FY12. The company is in growth stage. has now behaving like a commodity business in which none of the company have advantage over others. In the whole story , time may be right for small IT companies as their pricing it 20-30% lower than the big players.This is where companies like mindtree, hexaware might click in. We should appreciate the fact that there is a business behind every stock.If the underlying company does well the stock price will follow the positive momentum and vice versa. So it is important to know about the basic business of the company , to know about its business cycle , dependency on raw materials , operating costs currency fluctuation etc.There are infinite number of parameters but we should be able to identify and understand the main parameters which are responsible for the business of the company. Some people have edge in a particular industry and for them it is easy to invest in that industry.Do you have any edge in this industry? For e.g if somebody is working in telecom industry then he would be knowing about other players in the industry and may also be knowing which company is performing best in the industry and why? This gives huge edge to the person over other investors who are just following the financial statements and have less practical knowledge about the industry. One more point that we should look is that what do we know that market has not already factored in the stock price. For example Jubiliant Foodworks was trading at a PE of 75 in oct 2012 month , market has already factored all future growth of the company. In this particular case lot of growth has already been factored.So now why do we think that this stock can go further? We should list all reason as in why we think market has not got the stock price right and why do we think that future market price would be better than current price which market is offering. 23 do you understand business , do you have edge in this industry,what do you know which market does not know Neutral on this point as IT industry is the one of the most tracked industry in stock market.Most of the fundamentals and business developments are already factored in the stock price 3 One thing to note here. Big client generally work with more than 1 IT provider. Before investing in a company, it makes sense to a take a look at competitors in the same industry. We should compare the Gross Profit Margins , Operating Margins, Debt/Equity Ratio and Sales / Profit growth rate for past years. This can tell how the company is performing compared to its competitors. We should also know the market share of each of the company. In most cases , the company with largest market share is the industry leader with better margins. For e.g Asian paints is the leader in paint industry , with better growth rate and better margins than all of its competitors. But it can be other way round also for e.g In sanitary ware business , among the listed companies , hindware has the largest market share but its margin and growth rate is inferior to much smaller player Cera Sanitary ware , which is continuously increasing its market share. OP Margin - 35% , PE- 14 , Sales 31000Cr. NP Margin - 18%, PE - 10 , Sales - 1450 Cr. NP Margin - 11% , PE - 10, Sales -1900cr 3 Mindtree is a small sized IT company so it makes sense to compare it with companies like Persistent , Hexaware instead of Infosys,TCS. Mindtree is a well managed mid sized IT company. Currently almost all big players are operating in range of 25-35% of OP Margin and Mid Sized companies at 12-18%. Mindtree seems to have no competitive advantage over its competitors. What the company does ? Why do you think that it will grow in future ? What are the factors by which company's business can be impacted. Is the industry stable , is the industry growing ? For e.g Energy companies had their time in 90s .Telecom had their time from 2000- 2010 , now companies in telecom industry are in strong competition.Information Technology has almost seen its best part from 1995 to 2010 now the industry has become stable and is growing at 10-12% rate. We should have strong reasons to believe that the company will continue to grow in future and can mention all these factors in this section. 25 what company does ,your story on company , why do you think that company will become better than what it is today, or any other point Mindtree is a mid sized IT company.Company faced some challenges in past and now it is recovering. has to do lot of work before it can start getting big deals.It has just 4 clients which off more than 20$ mn revenue. Mindtree currently has pricing advantage, it has lower billing rates compared to big players but it could be in problem once big payers starts lowering billing rates to avoid losing clients. Mindtree look strong in mid cap IT space.Its quarterly results are much more predictable now.If the company can keep 3-4 quarters with positive growth then stock can demand P/E of 12-14. Long term story of the company looks promising. This indicates the overall rating of the company after analyzing the business , financial strength , management quality , growth and other fundamental parameters of the compan y. 1 means a very average company with low growth , low return on equity, needs lot of capital expenditure and have no competitive advantage. For all the factors above , it would be good to assign a weightage . It would ensure that we give more weight (importance) to factors that are competitive advantage to this company v/s industry . Also , as IT services (T & M) are linear revenue generation industry , number of employees and growth should be mentioned in the research above. Adding a section on Industry macro factors and government policies would further make the case for investing in a company more compelling. Thanks Jatin. we will add employee counts and its growth in case of IT in future analysis. weightage is already there in the cloud section.Circle size is displayed according to the weightage for e.g cash flow has weightage of 5 so it has circle of maximum size. We will industry and government policy section. © 2012 pupone.com. All Rights Reserved.